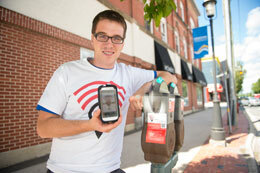 Pay-by-phone parking is now available at downtown Fredericton businesses, parking garages and metered parking spaces thanks to Phillip Curley, a civil engineering student at the University of New Brunswick—so long as they are branded with the red and black HotSpot Parking logo, that is. HotSpot generated a buzz in tech and start-up circles earlier this year when Curley won the 2013 East Coast Start-Up Weekend event, attracting a talented team of partners and earning $15,000 in start-up funds. Now the business has gone live as part of a five-week HotSpot Parking Pilot with the City of Fredericton. Once you register, HotSpot will send you a text message to warn you that your meter is low, and allow you to top it up from anywhere using a mobile phone. Parking officials will scan your license plate using HotSpot’s technology. While pay-by-phone services have been flourishing in cities like Vancouver for some time, Curley’s business model is unique. He’s on-boarded retailers and business owners around town who are now offering paid parking through HotSpot as part of their customer service strategy. Curley credits his start to the culture of entrepreneurship and innovation at UNB—particularly the support and mentorship he received from the Dr. J. Herbert Smith Centre for Technology Management and Entrepreneurship (TME) and the Pond-Deshpande Centre at the University of New Brunswick. The Technology Management and Entrepreneurship program works with students in many different disciplines to help them find their passion, generate ideas, and launch businesses. “TME equips students with the means to manage a successful technology-based business, like HotSpot,” says Phil Lambert, program coordinator and instructor with the TME in the faculty of engineering. Curley hopes to launch HotSpot in Saint John next, and is working on developing an app that will enable users to find available parking, and pay for services on their smartphone.